Here are two New York City hotels we’re crazy about, one of which is brand new, the other opened in May 2013. Both are wonderfully chic and contemporary with great art by New York artists, talk-of-the-town restaurants and bars, and New York views you can’t take your eyes off of. One is right smack dab in midtown on Fifth Avenue, the other in the vibrant Williamsburg neighborhood of Brooklyn. Step into the lobby of this Fifth Avenue beauty and you’ll think you’re at The Whitney Museum of American Art. The hotel has a world-class art collection of American master, New York native Alex Katz. Ten original artworks of his, including lithographs and block prints are featured within the hotel, and there are prints throughout in corridors and guest rooms. 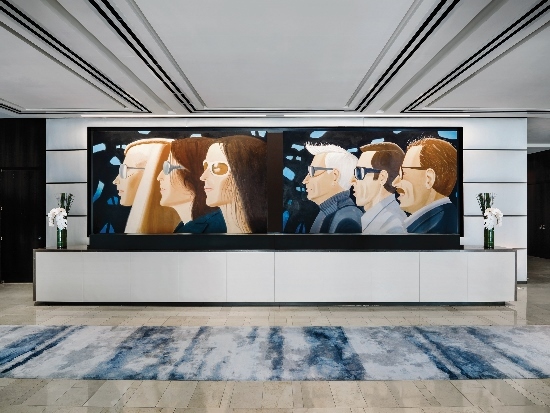 Pictured above is an oil painting in the lobby named Trio, chosen because of its representation of people in profile, which reflects the image of people walking by the building on Fifth Avenue. 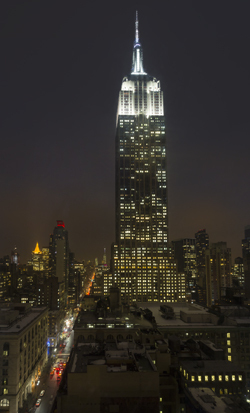 Imagine looking at the Empire State Building as you drift off to sleep and then…first thing in the morning when you wake up, there it is. Indeed, you can see New York’s most iconic building from the hotel’s Executive Empire State View rooms and the One-Bedroom Empire State View Suites. No matter how much time you’ve spent in this city, you can’t help but feel in awe at this sight. 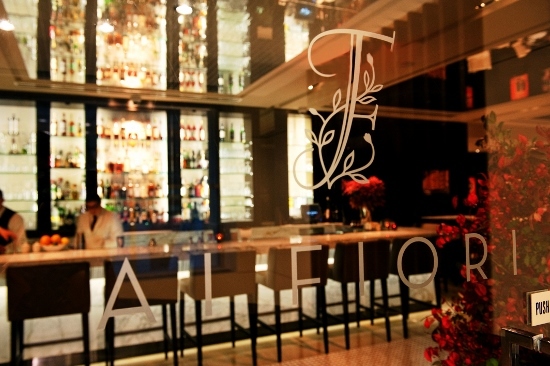 Ai Fiori, which translates to “Among the Flowers” in Italian, is a Michelin-star restaurant on the second floor of the hotel. A Michael White restaurant, it features cuisines from both the French and Italian Rivieras (including White’s signature hand-made pastas) with a wine list (1000 selections) to match. Langham Place is located at 400 Fifth Avenue, at the intersection of Fifth Avenue and 36th Street. Because of its midtown location, it’s ideal for those coming and going by train. As it is a member hotel of Traveller Made®, Farewell Travels is able to extend extra benefits to our clients who book through us including late check-out (subject to availability), free wi-fi and complimentary continental breakfast. The William Vale is a stunning new hotel that just opened in August (2016). 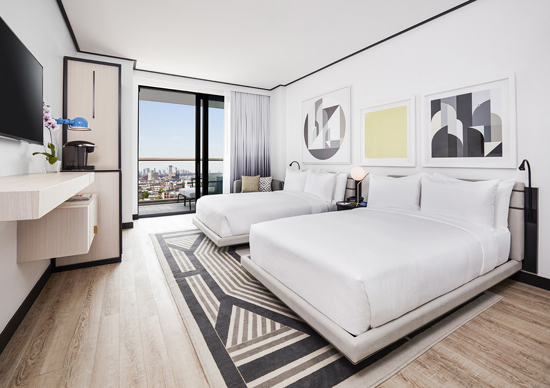 Guests here have the double advantages of being in Brooklyn’s hopping Williamsburg neighborhood as well as a short walk, taxi or Uber ride away from the heart and soul of Manhattan’s Lower East Side. On top of that, it’s just a 20 minute drive to La Guardia and 30 minutes to JFK—and an excellent option for spending a night or two before flying off somewhere (actually, kind of makes you hope you miss your connecting flight if flying through New York). From many of the rooms, there are seriously spectacular views of Manhattan and private balconies from which to take it all in. 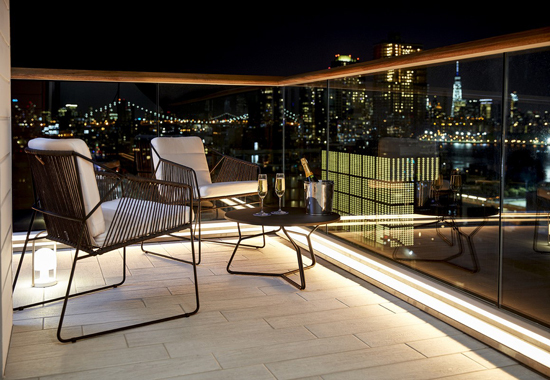 Pictured above is the balcony of the Gotham Corner Suite. But if you don’t happen to have one of the rooms facing Manhattan, the far-reaching urban views all around will not disappoint. Besides, you’ll likely spend some time up on the 22nd floor rooftop bar, Westlight, which is always abuzz at night with locals and visitors alike gathering for craft cocktails and small plates. Décor throughout the hotel is very hip, fresh and exciting. In fact, in the lobby, there’s an installation by Brooklyn based artist, Marela Zacarias and elsewhere, works by other local artists. 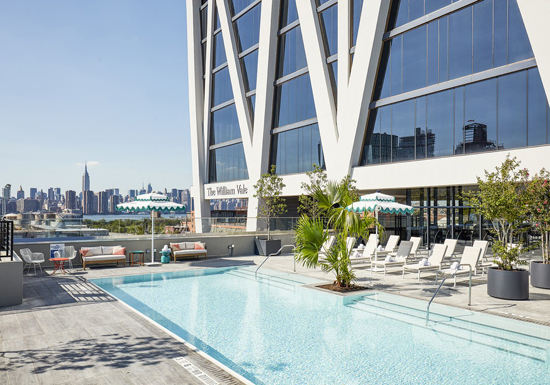 About as close to being a resort as you can get in New York City, The William Vale has an outdoor pool, which, at 60 feet, is the longest hotel pool in the city (open seasonally). Also on the property is Vale Park, which is an elevated outdoor promenade. One of its highlights is a retro-fitted 1974 Airstream where you can order up a burger and fries and soak up the views. The Brooklyn Vale is in Williamsburg, at 111 N. 12th Street. It’s an easy drive from Fairfield County and there’s valet parking which is half the price of parking in Manhattan. Photos courtesy of Langham Place and The William Vale. If you're looking for insider information on New York City, you've come to the right place. New York is in our DNA at Farewell Travels and we'd love to share it with you. We know what makes the Big Apple shine and can make your trip there unforgettable. We can also get you all sorts of goodies with our Traveller Made® affiliation at a number of the city's top hotels including room upgrades, breakfasts, and other benefits. Call us at (203) 222-7238 (EST) or e-mail here.